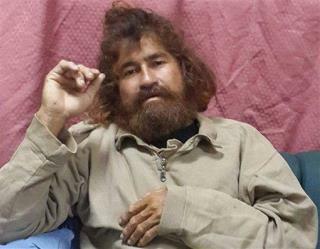 (Newser) – When Jose Salvador Alvarenga, a 36-year-old fisherman from El Salvador, touched land for the first time after more than a year lost at sea, his hair was wild and matted, his ankles were swollen, his wrists were tiny, he could barely walk, and he constantly hid his face. He had, as he later put it, "suffered hunger, thirst, and an extreme loneliness," and yet he didn't take his life. "You only get one chance to live, so appreciate it." His younger and inexperienced crewmate Ezequiel Cordoba didn't last much past the first month, refusing to eat after getting sick from raw seabirds, reports the Guardian. Now journalist Jonathan Franklin has conducted more than 40 interviews to tell the survivor's story in the book 438 Days: An Extraordinary True Story of Survival at Sea. He looks like Will Forte in The Last Man on Earth. He wasn't alone, he had WILSON!